Law enforcement agencies across the country are seeing a trend with payment card skimming devices being installed inside gas pumps. Skimmers are designed to covertly steal payment card information from unknowing victims when they purchase fuel at the pump. The stolen information is then used by criminal organizations to create cloned or counterfeit payment cards and withdraw money from ATMs, purchase money orders or pre-paid debit cards, and make retail store purchases. While many victims report the fraud to law enforcement agencies, ensuing investigative efforts are often met with no identifiable suspects. The Dallas Police Department Financial Investigations Unit wants you to identify what a skimmer looks like and know what to do to prevent yourself from becoming a victim of skimming. What does a skimmer look like? Figure 1 depicts a typical gas pump door with a skimmer installed (outlined in red). Criminals install skimmers inside the gas pump because customers and gas station employees are not able to detect the device without opening the pump door. 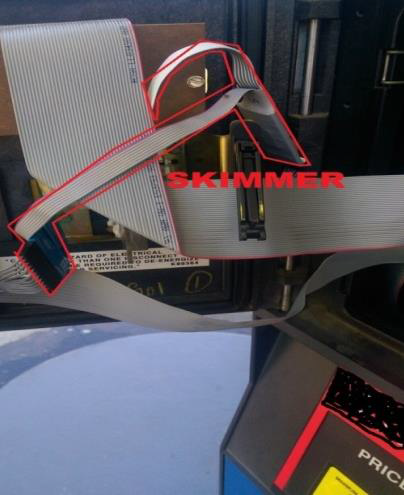 A typical skimmer consists of a 2” x 1” x ¾” circuit board covered in black electrical tape, grey duct tape, or most commonly – gray insulation tape that is shrink-wrapped around the circuit board as depicted below in Figure 2. Thin gray printer cables with “quick connect” feeds are used to connect the skimmer circuit board to the gas pump point of sale terminal. The best and easiest way to avoid becoming the victim of skimming is to pay with cash, but sometimes that is not always an option. When using a credit or debit card to pay at the pump, use the pumps closest to the attendant or clerk. Before you insert your card, visually inspect the fuel pump to see if the security seal on the pump is broken. If the seal is broken, immediately report this to the store attendant. Next, physically check the credit card reader. Tug on it to assure that it is on tightly. If you are at an ATM, physically check the keyboard. The keyboard may look bigger than normal which is a sign of a fake. Many of these skimmer devices are equipped with blue tooth. Turn on your BLUETOOTH from your cell phone and search for a device. If your phone detects a long string of numbers trying to connect, this is a sign that a skimming device maybe inside the fuel pump or ATM. There is even an application for Android cell phones called HC-05 that can assist in detecting skimmers. If you locate a skimmer device, please call 9-1-1 and immediately report it to police. Finally, be sure you have set fraud alerts with your bank so you receive notifications that will alert you to any fraudulent activity.